This is the easiest low-carb Tiramisu Mousse recipe. Very fast, and delicious. Mix together instant coffee and hot water. Let cool for 5 minutes. Mix powdered sweetener and Mascarpone cheese with a hand mixer until smooth. Mix in vanilla extract and 1 tablespoon of the coffee. Add up to the entire amount of coffee, depending on how strong you want your tiramisu. Fold whipped cream into coffee mixture gently. 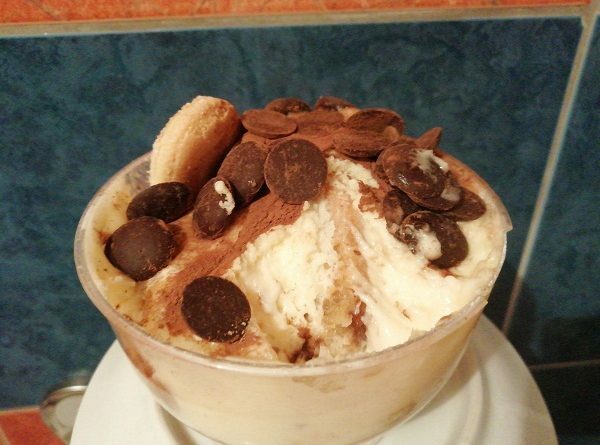 Place the tiramisu in a gallon size ziploc bag that is fitted with a large round or 1M tip. Pipe a small amount the bottom of each of 4 serving glasses. Top the layer with a dusting of cocoa powder. Continue layering the tiramisu and cocoa powder. Once you get to the top layer, sprinkle semi-sweet chocolate and cocoa powder over the tops of the serving dishes. Chill, covered, in the fridge until ready to serve.